This week – aspirin for primary prevention is dead. Only a touch of hyperbole here as the results of the ASPREE trial flip everything we thought we knew about aspirin on its head and draw to a close a rough month for the willow-bark-derived compound. Some quick background. We’ve had data for decades that aspirin can prevent recurrent heart attacks and strokes – secondary prevention. And, up until recently, mixed data leaned towards a benefit for primary prevention as well. The meta-analyses on this topic even suggested that there might be a benefit in terms of all-cause mortality, and, tantalizingly, a reduction in the risk of colon cancer if you take aspirin. ASCEND study - tiny effect, not worth the risk. Two weeks ago, we were treated to the results of the ASCEND trial, which looked at aspirin for primary prevention in 15,000 patients with diabetes. While there was a modest benefit in terms of a reduction in cardiovascular events, a fairly significant increase in the risk of major hemorrhage took the wind out of the sails of those results. Strike 1. Strike 2 was the ARRIVE study, a randomized trial of 13,000 patients with moderate cardiovascular risk. Aspirin had no effect on all-cause death or the cardiovascular outcome. And now, strike 3 comes in the form of a trio of papers published in the New England Journal examining the results of the ASPREE trial. These studies paint an even bleaker picture for aspirin. The ASPREE trial was a huge study, enrolling almost 20,000 individuals in the US and Australia. It was targeted to older adults – greater than age 70 – a group expected to be at higher risk of cardiovascular disease or death. ASPREE study - higher all-cause mortality with aspirin. Uh-oh. The primary outcome was a composite of death, dementia, and disability, an effort to capture the fact that in an older population, simply living longer is not always the only goal. Aspirin had no effect on the primary outcome. But the results get weirder. Looking just at all cause mortality, the rate was higher in the aspirin than the placebo group. ASPREE study - higher cancer incidence with aspirin. Wha?! Fortunately, absolute mortality rates were really low. It would suggest that for every 100 patients you treat with aspirin, you’ll see one extra death over a five year period. This is tiny, but still, this is aspirin. What happened to the wonder drug? Spurred on by these strange findings, the authors published their second paper in the Journal, examining the causes of death. And the findings were driven by… wait for it… cancer. This is where we’d insert a record scratch if Impact Factor wasn’t such a sophisticated production. The rate of new cancer diagnosis and death from cancer was higher among those taking aspirin compared to those on placebo. This runs counter to much of what we’ve been told about aspirin in the past. And here’s why. Death was not the primary outcome in the ASPREE trial. We specify a primary outcome because we know that the more outcomes we test, the higher the chance we see a false-positive. In fact, if you account for multiple comparisons in the ASPREE study, the “death signal” would not have achieved statistical significance. We would chalk it up to simple noise in the data. Nevertheless, now we go down this rabbit hole and try to explain why death is higher. And what you have to realize here is that if we got a skew in death rates by chance alone something would have to explain it- everyone dies of something. So the finding that it was “cancer” is not necessarily that weird either. My number 1 rule in medical research goes like this “one study doesn’t prove anything”. One study can suggest. One study can raise doubts, but one study never proves. So let’s not jump on the aspirin-causes-cancer train. Too many prior studies conflict with that finding. What we do have here though are multiple studies, in multiple moderate risk populations which all reach the same conclusion. Aspirin has no role in the primary prevention of heart disease. Observed cardiovascular event rates vs. expected rates in three major randomized trials of aspirin. Has something changed? Actually, yes. We are way, way better at preventing heart disease than we ever were in the past. We treat cholesterol and blood pressure more aggressively, and we manage diabetes much better. 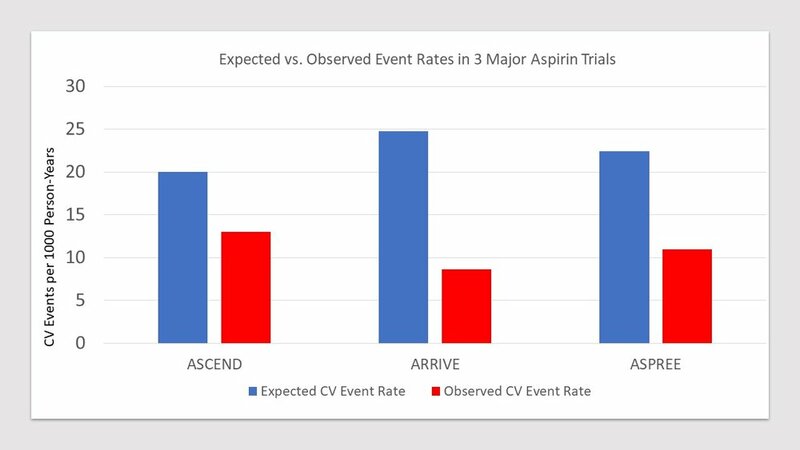 In fact, all three of these trials share one other point in common (aside from the fact that they found that aspirin did essentially bupkis) – they all dramatically overestimated the cardiovascular event rates they’d see. Our old risk equations aren’t that good anymore. Because we are doing a better job at reducing risk. And in this brave new world, aspirin appears to have lost its mojo. So aspirin, my old friend. Good night sweet prince: and flights of platelets sing thee to thy rest. This post first appeared on medscape.com.